There are four imperial cities in Morocco and Fez is one of them. 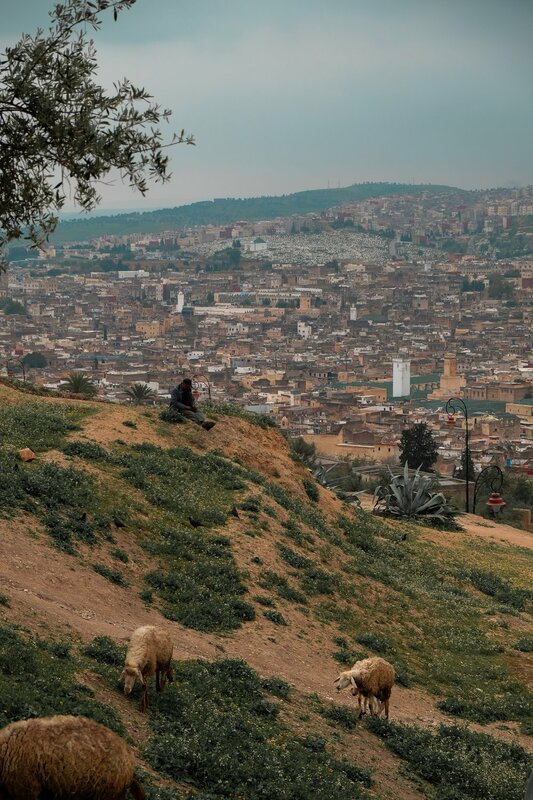 Unlike Rabat, which is the country’s current capital city, or Marrakesh, which is Morocco’s tourist capital, Fez is still relatively preserved from mass tourism. Yet, one walk in its medina is enough to feel like you’ve jumped back in time and fall in love with the place. 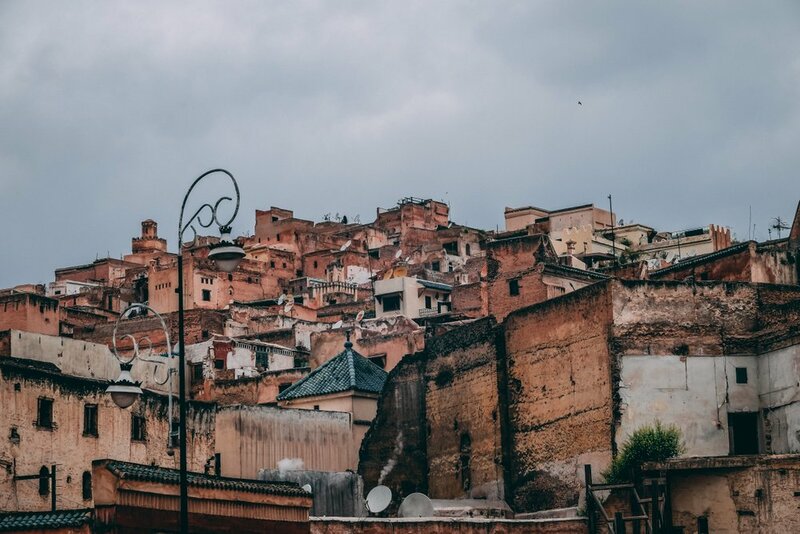 With its back alleys conveying an aura of mystery, its beautifully carved doors hiding many treasures from sight, along with some of the holiest places of worship in the country, its refined cuisine and authentic crafts, Fez alone is worth a trip to Morocco. Finding your way in the Fez medina is an impossible task and you will get lost, no questions asked. Luckily, that’s the right way to do it! Still, here’s a few amazing spots to help you not to miss out on some of the most amazing spots in the city. What’s best than starting your exploration with a view on the whole city? And what better place for that than the Merenid tombs, a necropolis of old overlooking the medina. 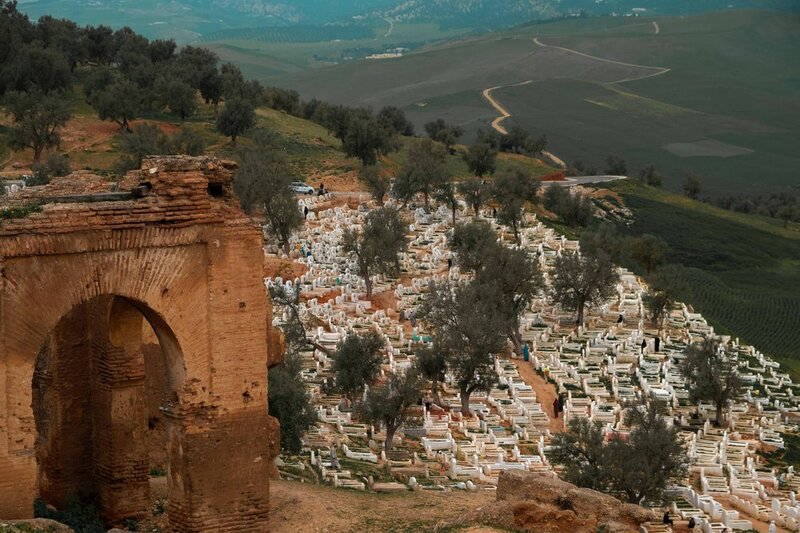 The tombs themselves are crumbling down but their location makes up for everything, nestled in between the old medina and the mountains, between a peaceful graveyard where locals come to pay one last tribute to their loved ones and a bare hill where shepherds watch over their flock of sheep. The tombs are a junction point where the city tries to reconcile all its different sides, from the sea of rooftops and minarets calling to prayer down below to the quiet, rustic mountains on the other side. That’s what makes it such a perfect starting point to discover the city, not to mention that many places remain out of reach within the medina but not out of sight when you’re on top of the city, such as the Kairaiouine Mosque, whose green roof rises above all others. Unlike mosques, which cannot be entered by non-Muslims, the Islamic School of Bou Inania can be visited by anyone. More than that, it should be visited. Built during the 14th century by Sultan Abou Inan Faris, member of the Merinid dynasty, this medersa’s architecture is unique. Most medersas only house prayer rooms dedicated to the study of religious principles but this one also shelters a mosque and a minaret, whose green zellij welcome the visitor when they enter the city through the gate of Bab Boujloud. The inside of the medersa showcases the splendid craft of the Merinid, with the eye feasting on walls covered in bright, symmetric mosaics, lace-like carved stuccos and elaborately carved cedar doors. You could easily pass by the entrance to the medersa without noticing it though so pay attention to the sign next to the door not to miss it. Looking for the epitome of a hidden gem? The Glaoui Palace is the one place. Located on the fringe of the medina, the palace is one of many places in Fez whose hidden treasures cannot be guessed from the outside as is entrance looks every bit as plain as the many doors on that street. Yet, you’re contemplating an architectural masterpiece. Do not be afraid to step inside and you’ll be welcome by the owner of the palace, Abdelkhalek Boukhars, who’s been trying to keep the place afloat for decades and stop it from decaying. Unlike many palaces in the city, the Glaoui Palace has not been turned into a profitable hotel and one of the only resources that Abdelkhaled has is the money that daily visitors give him. In exchange, the Palace remains open to all. Sure, the colours on the walls are fading, there are homemade scaffolds in some of the courtyards and pigeons have nested on the roof, but it feels real, eerie yet majestic. There is true beauty within the palace’s walls and visiting it does help saving it. Abdou, the owner’s nickname, also exhibits his paintings in one of the rooms, where modern arts meet traditional Moroccan architecture. You can buy one of the paintings and Abdou will send it to your home so do not hesitate to ask for the price. 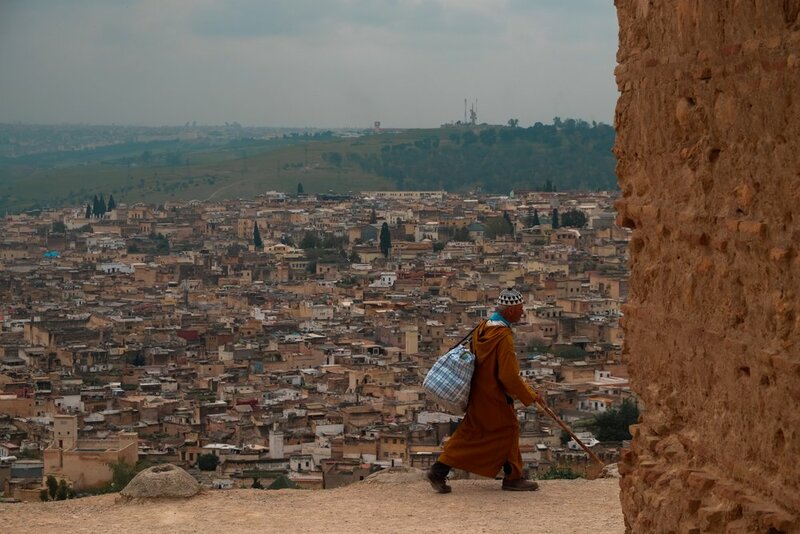 Fez is well-known for its architecture but most of all for its cultural heritage, from gastronomy to traditional handcrafts. The Nejjarine Museum of wooden arts and crafts is one of the best places to exhibit the variety of these crafts but those traditions are very much alive in the current life of the city, so much so that you can find craftsmen at every corner practicing their art through techniques that have been passed on with every generation. Another major tradition that still exists in Fez is the craft of producing leather in one of the operating tanneries within the city. All tanneries are in the same spot of the medina, with the most iconic one being the Chaouwara Tannery. Visitors can get a glimpse of a process that hasn’t changed much since medieval times from one of the many viewing terraces surrounding the tanneries. Make no mistake, those terraces are nothing short of tourist traps. You’ll be approached by a random person in the street, you helpless tourist, and will be shown the way to a terrace through a local shop, after being handed some mint to fight the pungent smell. In return, you’ll be expected to buy something. Obviously, there will be no price tag so get ready to negotiate. If that doesn’t seem fair to you, move on as this is the way to do it, but you’ll be missing on quite a fascinating spectacle. First thing first, the Royal Palace is closed to the public. The only thing you’ll get to see is its imposing, golden gate, which is a sight to behold nonetheless. What’s most interesting is how to get to the Palace. Located outside of the medina, the Royal Palace sits right next to the Mellah, otherwise known as the Jewish quarter of Fez. There isn’t much of a Jewish population left nowadays but their architecture is still standing and most of all the houses with large, open balconies that contrast with the homes of the medina, hidden behind high doors and mashrabiyas. Called the new Fez, this ancient quarter seems to give the word new a pretty interesting meaning since it is 700 years old. Wandering through its bustling streets and markets makes for a compelling walk and can be quite oxygenating in comparison with the narrow, confined streets of the medina. You can stop on the way at the Ibn Danan Synagogue before finally reaching the doors of the Royal Palace. On your way back, consider paying a visit to the Jnan Sbil Garden too, maybe even buy some sweets from street vendors outside of the garden.